Today's card is an experiment in watercolour rainbow painting. I have been inspired by the talented Kristina Werner for a number of years, and love watching her videos. I would love to be able to paint watercolour as well as she does, I guess I need lots of practice. I used Shimmery White cardstock for the watercolour piece, which has a very subtle shimmer that shows up in the light. It's a bit tricky to photograph. 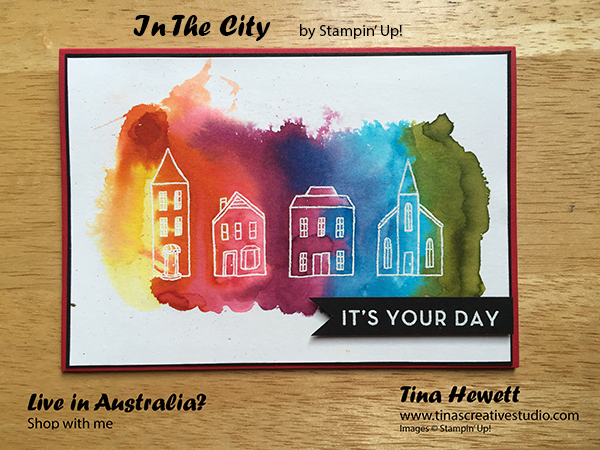 I used some of the cute graphic images from the stamp set called In The City, which is a "host" set that you can get by having a workshop or gathering with friends, collecting orders and earning Stampin' Rewards. I stamped them in VersaMark ink on the Shimmery White, then sprinkled on White Embossing Powder and heat set it with my heat tool. Once the images were set I used my Aqua painter to first brush some clean water on the card, then I picked up some ink colour from a palette and added that to the water. I started with Daffodil Delight, then Pumpkin Pie, Real Red, Rich Razzleberry, Pacific Point, Tempting Turquoise and Old Olive. I dabbed a paper towel in between colours to pick up some of the excess water. I also used my heat tool to speed up the drying in between. It's a technique that has a different result every time you try it. 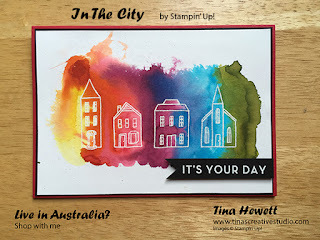 The sentiment is from the stamp set Big on Birthdays and is stamped in Versamark on Basic Black cardstock and embossed using White Embossing Powder, which is heat set. The watercolour panel is matted onto Basic Black cardstock and the card base is Real Red.